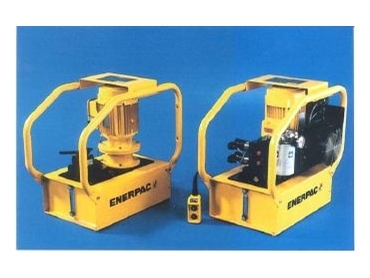 Enerpac GPEM-3420W and GPER-5420WFHL modular electric Hushh pumps. A NEW series of high-pressure hydraulic pumps designed to set world standards of versatility and operating quietness have been released in Australasia by Enerpac . The new Enerpac GPE series of modular electric hush pumps features totally enclosed fan-cooled motors that are suitable for many outdoor uses while producing only 70-74dBA for quiet in-plant applications. All 2, 3 and 5 series pumps - with motor sizes of .75, 1.1 and 2.2kW - are available with two-stage operation for speed and power. The first stage provides high oil flow to facilitate rapid tool setup, while the second stage provides maximum actuating power at pressures up to 700 bar. Enerpac says the new pumps feature a modular design that facilitates installation, either in the factory or in the field, of different optimum valve configurations for tasks such as lifting, pressing, pulling, punching, forming, workholding, maintenance and automated fixturing. Enerpac Australasia general manager Roy Coulson says the pumps' implanted motor offers outstanding quietness for workplace safety and comfort, especially where used for repetitive normally noisy operations. Their modularity allows rapid installation of various valve configurations and of the many accessory kits available, including return line filter kit, heat exchanger kit, float/temperature switch kit and pressure switch kit. Accessories fit the exterior of the pump, which means it doesn't have to be disassembled to incorporate them. All pumps are equipped with quick-connect electrical connectors, keyed to ensure correct connections, so accessories can be added and subtracted swiftly at any time. Two-stage operation for fast setup. The first stage provides approximately 10 times higher output flow than the second, at pressures below 55 bar. This permits fast hydraulic cylinder plunger movement towards the load, reducing cycle times and increasing productivity. Remote pendant controls and 24V dc solenoid valves for safer operation. They also have a user-adjustable external pressure relief valve and easy-to-read integrated oil level sight glass. Totally enclosed fan-cooled motors ideal for outdoor use in many environments. Pumps have a 40 micron filtered breather with splash guard. If electric power supply is not available, Hushh pumps are also available with an air-driven motor.